R & K Smaragdgrun looks like a nice average green. I have to be honest – this is one of the very few ink swabs that I’ve posted this year that I have absolutely no memory of seeing, swabbing, or scanning. Kinda makes me want to dig it up and ink it up! 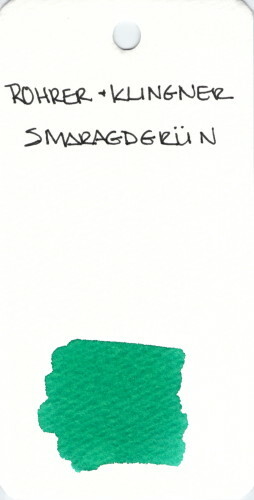 This entry was posted in INKS and tagged green, ink swab, rohrer & klingner by Christine (Pentulant). Bookmark the permalink. This is my first bottle of R&K (well it was bought with Konigsblau so it’s hard to say which is the first). I used to like it but now I dislike greens like this, with a lot of blue in them. Greens with lots of blues (leaning in the direction of teal) is probably my least favorite shade of ink. And then there is Pilot Iroshizuku Ku-jaku – I love that color because it is so rich and has much more blue in it.